One of the most valuable tools to fire fighters as well as search and rescue teams is the “Isotherm” tool on a FLIR XT. But what exactly is Isotherm and how do you utilize it’s properties to help your search and rescue operation? Isotherm, or as FLIR calls it on their cameras “The Color Alarm” is one of the oldest thermal measurement tools dating back to the 1960s. You’ll see Isotherm on your DJI software, while FLIR calls it a Color Alarm on their software – other cameras could call it something else, to include a dew point alarm – either way it is a setting that allows you to highlight a given temperature level. It will take the temperature levels you desire (usually high 100, mid 90, low 80) in order to pull out those temperatures and then make the other temperature noise, graying it out. For our purposes here, isotherm is to help highlight a person on the earth. 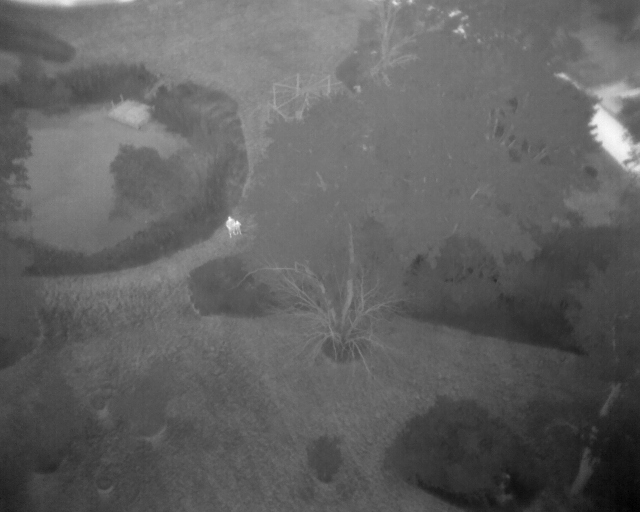 FLIR aerial cameras have a 5×5 pixel reading (the circle dot on the display that is the “temperature reading”). Many believe that the actual reading on the dot is per pixel, but it is not, the dot is actually a 5 pixel diameter circle. Therefore, you must take into account the “Spot Size Ratio”. The spot size ratio is the object’s size (a person) to the distance from the camera. Basically, if you want to find an individual using isotherm most efficiently you will need to look at the size of the individual, then adjust your altitude to ensure you can see an individual. Theoretically at 300ft on a Zenmuse XT 13mm 640×512, the Spot Size ratio is 4.7 inches. There are many factors to infrared science and it just gets harder outside with wind, solar, and other energy constantly changing the dynamics of your readings. The lower the outside temperature the easier it will be for you to utilize the isotherm feature to find individuals. But as the outside temperature approaches human body temperature, the less useful the tool will be. We recommend only using the Isotherm when the outside temp is below 80 degrees. This is because the noise created by infrared reflections can cause false readings or highlight too many items. At this point it is best to utilize a pallet that allows you to see movement on the ground. You can have success seeing individuals through tree canopies, however; the individual and/or the aircraft need to move to have the best results. Take multiple pictures in a search pattern and hand off the disk with photos to another searcher to look through the pictures in more detail.